Congratulations to Marcus Cobb for receiving a 2019 Urban Parish Spirit Award! 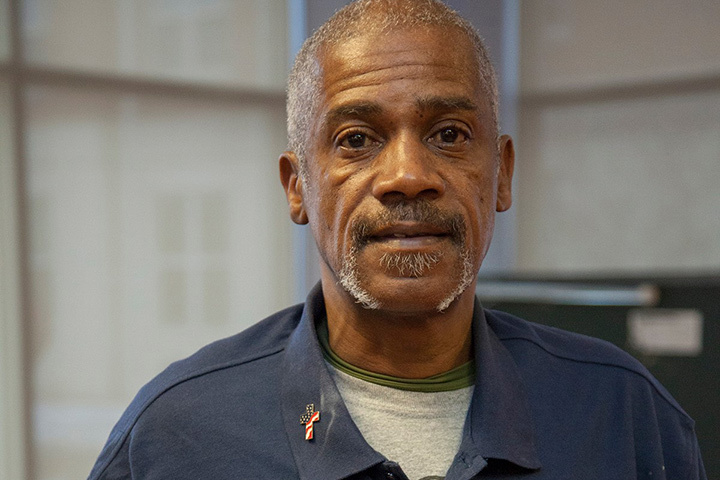 Marcus is a resident of our Piquette Square for Veterans. Marcus was honored for his numerous volunteer efforts. He is a member of Our Lady of the Rosary Detroit parish, where he serves as an usher, a volunteer, and a mentor to people participating in the NA and AA programs. He is the President of the local Reboot Association, which seeks to improve the lives of veterans with mental and physical challenges. He volunteers with the Weekend Survival Kits program, which provides food for low-income families in several Detroit Public Schools every week during the school year. He is a supervisor of Better Way Detroit, which serves Detroit’s homeless by offering the dignity of paid work to help beautify the city. Finally, Marcus is a leader at Piquette Square and is always willing to help with the numerous volunteer events there. The Urban Parish Spirit Awards are meant to “Celebrate the Spirit of the Church in the City.” They are presented by the Detroit Catholic Pastoral Alliance’s Urban Parish Coalition and the Archdiocesan Office for Black Catholic Ministries. Marcus received his award on February 13th at the 11th annual event.